AFC Fylde manager Dave Challinor says he doesn’t anticipate having much time to rest this summer with preparations already underway for next season. 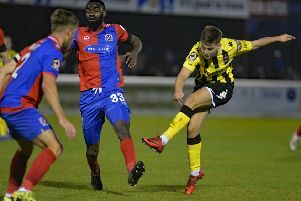 Challinor guided the Coasters to the play-offs this season in what was their debut campaign in the National League, losing to Boreham Wood at the elimination stage. Fylde will want to go one better next season in their bid to become an EFL club – and to achieve that the club must get their pre-season preparations spot on according to Challinor. When asked if he was looking forward to a summer break after a long, hard season, Challinor told The Gazette: “It’s not so much a break because the next few weeks are massively important. “We will have a break where we go away for a week but do I expect to put my phone down? Absolutely not. “Then you’re straight back at it and it’s a quick turnaround. “I think we’ll be back on June 25 and you’ve got to put a pre-season schedule together before the season kicks off on August 4. “I suppose at some point you’d like to recharge your batteries but having been part of this process for eight or nine years now, I know it can be just as busy as the normal season is. Challinor also revealed the Coasters may have to play the majority of their pre-season friendlies away from home. That’s because the Mill Farm pitch, which has caused a number of issues for the club this season, is due to be relaid having been ripped up on Thursday. Challinor is still hopeful of bringing one or two high-profile clubs to Mill Farm, but admitted the current situation is not ideal. “We’ve had issues with the pitch so we’re having that redone, so the work is continuing,” he said. “Whether we get any home games, we’ll have to wait and see. “At the minute we’ll have to put away games in and for home games it might be a bit different this year in terms of playing games against clubs higher up as behind closed doors games. “That’s still up in the air but it’s certainly not ideal. But we will see where we are.